100 years of Bauhaus; 100 years of an inspiring art movement. From 16th until 24th of January an opening festival was organised to celebrate this anniversary. During this event multiple artists were invited to show their performing art at the Akademie der Künste in Berlin. ARTE showed the 360 music video “Das Totale Tanztheater 360“ with the help of VR Owl. The video is based on Walter Gropius’s vision of a “total theatre“. 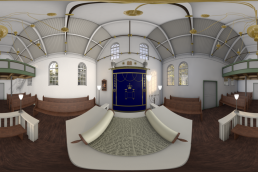 "By explaining history in such an innovative way, more people are lured to the synagogue"
“Das Totale Tanztheater 360” was shown through the use of Oculus Go’s. Visitors and journalists could see a special dance choreography from the famous choreographer Richard Siegal. The music in the video was created for this event by the German band Einstürzende Neubauten. The 360 video was shown during the press conference before the festival and to public during the festival, where the VR Owl event team supported ARTE. Federal President of Germany, Frank-Walter Steinmeier, opened the Festival on the 16th of January. From that moment on the public was able to visit the diverse art installations. Visitors were not just watching a video, but they were in the same room as the dancers through the use of virtual reality. This created an experience that will not soon be forgotten.The video can still be viewed in the application ARTE360.